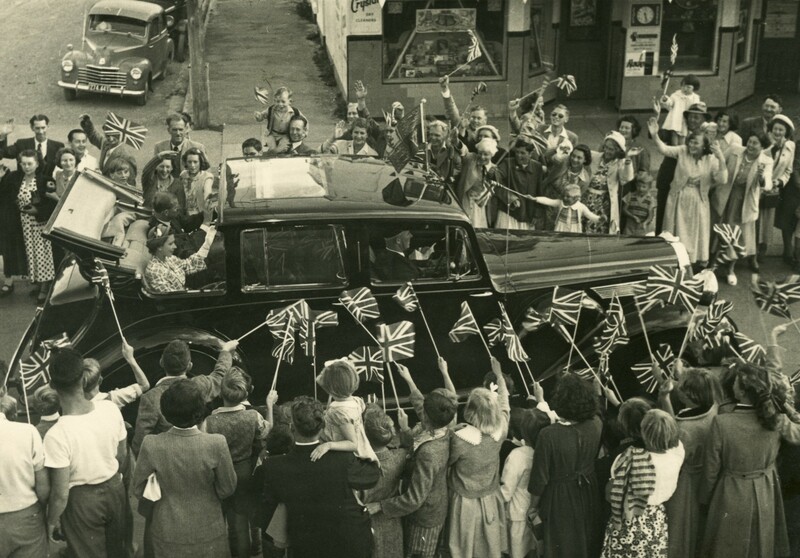 Loyal Royalist Follows Visit of Queen Elizabeth II, January 1954. I have just finished reading a series of letters Molly Whitelaw wrote to her family enthusiastically describing her impressions of the visit of Queen Elizabeth II to Wellington in January 1954. The letters brought back my ten-year-old memories of standing outside Taita South School, in the Hutt Valley, waving my flag (Union Jack) as she passed by in an open car. 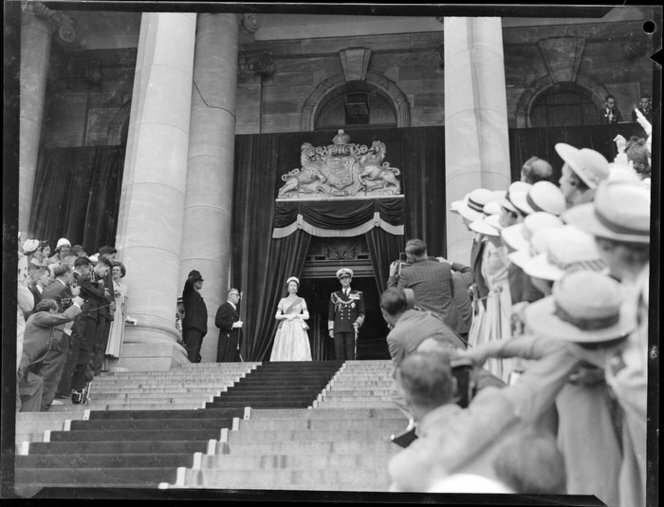 Then, opening my Facebook that evening, there was a 35 mm movie of the Queen’s Coronation Royal visit to Dunedin in January 1954, produced by members of the Otago Cine Club. With this serendipitous happening I can’t but help share some of Molly’s impressions of the young Queen as she followed her around Wellington. On a ‘superlatively beautiful afternoon’, dressed to the nines in her grey-green shantung outfit made my Madame Baraldi of Jacqmars, London, Molly and husband Alan, in his attire and top hat, and son Alastair in ‘suitably-aged double-breasted blue jacket and grey tie’ attended the Royal Garden Party at Government House. Wandering the ‘beautifully cultured lawn’ she delighted in meeting many friends and admiring the colourful dresses and ‘the pretty hats large and small, such as the Queen favours’. The appearance of the royal couple sent ripples through the crowd as they slowly moved around. Molly, disappointed that she had only a back view of the Queen, described her in great detail anyway, down to her ‘softly-tanned creamy skin, her ‘bamboo-cream pure shantung outfit and cap of ostrich feathers’. But, ‘by a marvellous stroke of good fortune,’ the Queen turned towards them, stopping to speak to a uniformed group. With a perfect view, she shared an exuberant description to the family of the Queen’s poise and bearing, graceful half-bows and ‘sweet gravity, which characterises her in most of her portraits and photographs’. Added to all this excitement was watching son Alastair, recently returned from his compulsory military training, participating in a 100 strong Royal Guard of Honour marching in from the Wellington Cenotaph and later at the opening of Parliament.Molly’s pride evident as she wrote, ‘I must say they marched well; and their bayonets flashed as they presented arms in one shining, simultaneous row of steel’. Molly the royalist, took every opportunity to view her new Monarch. The Queen, wearing her magnificent Coronation Gown, when standing on the steps of Parliament was ‘a resplendent and beautiful figure’. Through her binoculars at Athletic Park she followed the open car as it travelled among the children, but she noted that the Queen smiled very little. Then, there was the return from the Races, and from Masterton when she wore ‘a most becoming red hat’ and on this occasion Molly noted her ‘smiling gaily’. Making it to Paraparaumu Airport, on their way to Napier, Molly’s last view ‘of the beloved Royal pair was a white plane, flying off into a blue sky, with that precious burden en route to Blenheim’. Molly and her husband Alan had the occasion to observe the Duke more closely than most New Zealanders. The worst train accident in New Zealand occurred at 10.20pm on Christmas Eve, 1953, when the Wellington to Auckland Express plunged into the flooded Whangaehu River at Tangiwai, in the central North Island. Of the 285 passengers and crew, 151 lost their lives with 21 unidentified at the time. 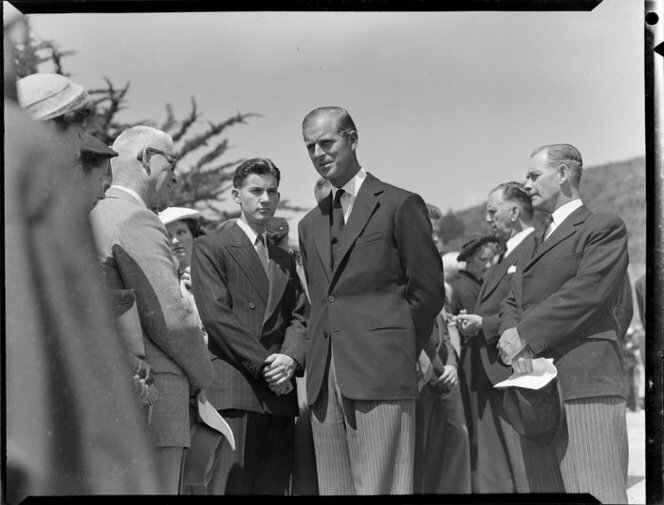 The Duke attended the State Funeral at the Wellington, Karori Cemetery, and laid a wreath where the mass burial took place. Molly was greatly moved by the Duke’s ‘natural and compassionate manner and gentle, sympathetic words’. Alan Whitelaw in his capacity as a local minister had spent a week supporting the families who had lost their loved ones and were unable to return home with the bodies. It was therefore, appropriate for Molly and Alan to attend the Funeral Service. The accident left a shadow over Christmas 1953, for many across New Zealand. ‘Tangiwai’ takes its name from ‘the tears that come from great sorrow’ – ‘Weeping Waters’. « Book Review: Occupy until I Come: A. T. Pierson and the Evangelization of the World.